Can you build a successful business without losing the personal touch? Today was a day of unusual emotion for me. You see I value my relationships very much. When allowing someone into my life, my heart and my coaching business I do not take his or her time for granted. Never focusing on money or their place in life is an important part of building that relationship. Monday mornings are the day of the week when I block out an hour to learn how to take my auto transport coaching business to the next level. Even though our nationwide auto transport business has been successful for over six years there is never a day goes by that I do not learn something new. In order to take that success to the next level requires learning from someone who has done what I want to do. My business coach, Sandi Krakowski has done just that. It was on one of these training calls that I broke down in tears. What could make someone cry on a business training call! In one of the exercises our class went through, Sandi asked some generic questions of one of my classmates. It so happens that this classmate and I have developed a friendship. Over the course of a year, we both have been working with Sandi. It is a relationship founded on truth. Each of us is very comfortable being who we are, strengths, weaknesses and all. As my friend was going through the exercise, she was really digging deep for the answers she felt in her heart. As we all listened very intently to get the most value out of the lesson, her words cut me like a knife slicing through bread. I will recap the questions and responses so you can get a glimpse into why I felt the way I did. We were talking about being able to serve our ideal client so they have the best chance of success. Whether we talked about nurses or nationwide auto transport clients was irrelevant. The lesson we all were about to learn applies to every human being, the world over. Question number one was similar to – what do people at your job want most. Question number two – when you and your co-workers gather round the drinking fountain what do they complain the most about. You get the point, right. The answers that followed really hit me hard as I was listening to my friend…I took it very personal, as if it were me! Without incriminating anyone or any given employer, I will be vague about her exact answer. The gist of her comments boiled down to this – the employer did not give one hoot about the employees. The only concern that company had was about procedure and covering their butts. One person who is not in our class, but an employee who works beside my friend actually quit. She quit due to the "sterile" attitude of the administration when asking for time off for a very special time for her and her family. Her husband is returning home from a tour in Iraq and they would not give her time off! Okay, can you understand now why I burst into tears? The cold-blooded gall of that place! The reason I left corporate America was for similar reasons. My employer did not give one hoot nor holler if I ever got to see my new grand-baby. Their only concern was the success and profitability of their company. The day is upon us my friends when there no longer is loyalty between corporate heads, administration or staff towards their fellow employees or co-workers. Gone are the days when co-workers have fellowship outside of work hours and environment. No more company picnics where dads compete against dads, kids become life long friends. Today it is all about the bottom line and covering your own behind forget about Suzie Q. As we prepare to launch our coaching and training program this call could not have come at a better time. It is a stark reminder to keep our clients needs ahead of our own. Oh sure, we all have to make sure our "i's" are dotted and our "t's" are crossed; however, not at the expense of another human being. Maybe that is why our nationwide auto transport business continues to grow. Maybe this is why some of our dependable auto shippers send referrals to us. Maybe that is why our clients who need to ship their car refer their family and friends to us. Because we care about each one of them on a personal level, they are not just a number. Each customer has a family. Each customer has needs, wants and desires to live a healthy, happy life in harmony with the rest of us. If we can provide just one service where they get all of that and more under one roof, maybe that is why we can go to bed at night and sleep like a baby. Therefore, I am thankful to my business coach, Sandi Krakowski for teaching me how to dig deep to grow a business that truly serves people. Service is more than superficially giving something. 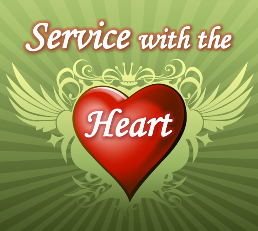 Service is when you give all you have, from your heart and then some. Our nationwide auto transport customers get that type of service because we refuse to act and run our business like my friend's administration treated her. No way! It is time we all take our stand and demand the respect in the work place that we all deserve.